Lucidchart integrates with Confluence Cloud so you can create custom diagrams and embed them in wikis. Here’s how you can install and configure the connector. Team and Enterprise accounts can install our Confluence Cloud connector for free. Others will need to first start a Team trial to install the connector. To upgrade an existing personal account to Team, visit the Subscription Level page. Click the gear icon on the side menu and choose “Find new add-ons” under the Atlassian Marketplace. 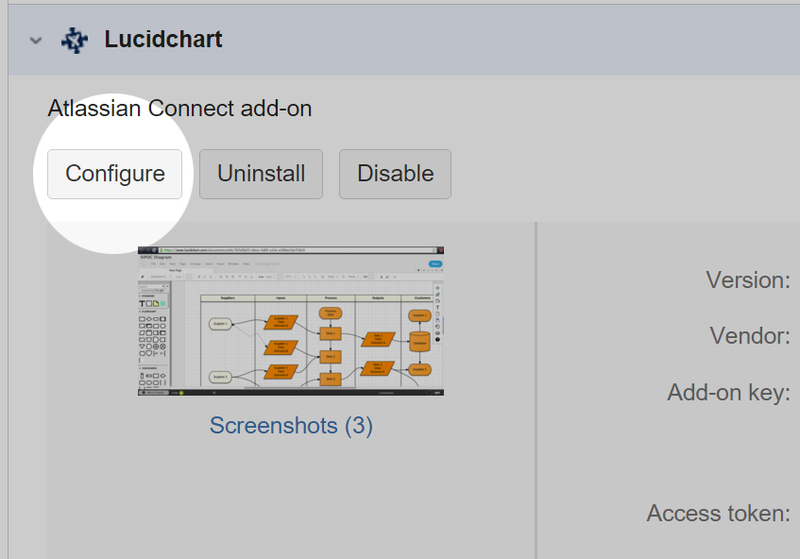 Search for “Lucidchart” and click “Install.” Follow the instructions to complete installation and then close the dialogue box. 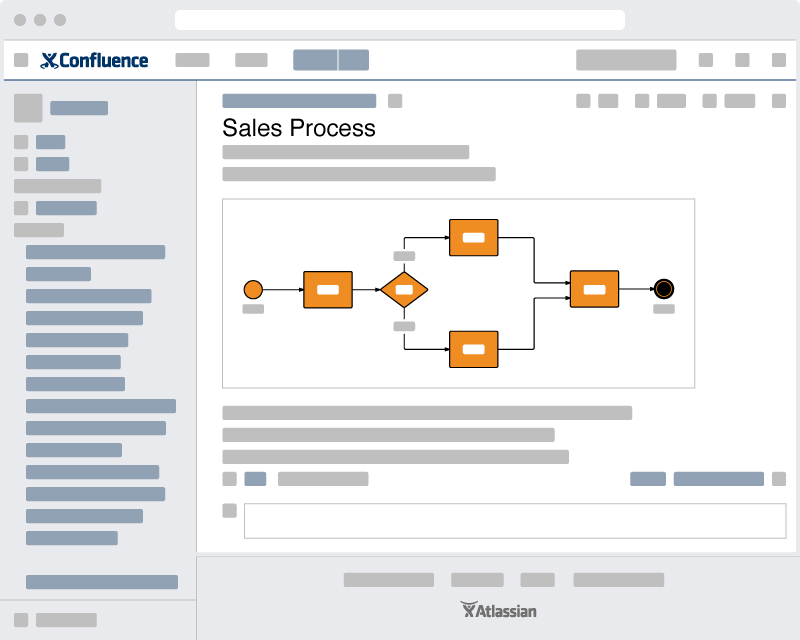 Alternatively, you can install Lucidchart from the Atlassian Marketplace. Click on “Manage” or go to "Manage Add-ons" and find Lucidchart. Hit “Configure” and follow the prompts to connect your Lucidchart Team account with Confluence. 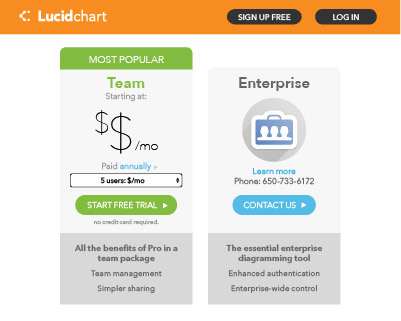 Make sure you are logged into Lucidchart as a Team Admin. Select “Invite users to join your team” or visit www.lucidchart.com/teams to grant additional users full or view-only access to Lucidchart. In the pop-up window, insert an existing diagram, create a new one, or import a Visio, Gliffy, draw.io, or OmniGraffle document directly. For new diagrams, click the orange “+Document” button. The arrow will open a template picker for different types of diagrams. Creating a new document will open our editor in a new tab. This short tutorial explains the basic components of creating your diagram. After creating your document, you can then insert it into the Confluence page. A new panel will appear on the Confluence page that contains all diagrams attached to it. Anyone with access to the page can view the diagrams attached to it, but only those invited to collaborate can edit them. To let others edit, extend permissions from the Lucidchart editor or documents list. In Confluence, click a diagram’s thumbnail to open it in a full-screen viewer. Click “Edit” in the right-hand corner of the Confluence page. Click your diagram and choose the light gray “Edit” button. You’ll see a window titled “Edit Macro Settings” where you can enter a page range, alter the width and alignment of your diagram, and update the diagram. Click “Update embedded diagram” to sync changes already made, or hit “Edit diagram” to open the document in the Lucidchart editor. You can then modify the diagram if you have ownership or sharing permissions to do so. Click the Remove Diagram link to remove the diagram from your wiki. You’re now ready to start using Lucidchart for Confluence Cloud. If you have any further questions, just send an email to support@lucidchart.com and we'll be glad to help.